About 400 year ago a complete deforestation on Easter Island lead to a collapse of the Easter society. Jared Diamond described in its bestseller ’Collapse’ the reasons for this ‘ecoside’. The author pursues the question why some societies collapsed and others didn’t. Tikopia Island and Easter Island are both tiny South Pacific island which faced similar environmental problems of forest destruction in history. On Tikopia Island people were able to manage their problems by micromanagement of resources and a strong regulation of population size Tikopai successfully gardened the island and hold their population constant. On Easter Island people took the disastrous decision to fell the last tree. This environmental collapse lead to starvation, civil war and cannibalism on Easter Island. What made the difference? Tikopia was a small island with a bottom-up governance. Village leaders were familiar with the entire island and identified the common sustainable long-term interest of sustainable. Decisions were taken collectively. However on Easter Island central political were blind to deforestation problems and failed to make decisions because they were preoccupied with short-term motivated power conflicts of the elites and were distant to the problems of the People. People on Easter Island failed also to notice the problem because gradual change of the surrounding landscape was taken for granted since people experienced in their personal life no other way how the environment looked like. The state of a deforested island was normal for them because they did not know how the island looked like 50 years ago. This creeping normalcy lead to a ship in baselines, so that people failed to notice the urgency of the problem. The collapse of Easter Island can been seen as metaphor for the challenge of climate change laying ahead of us. Societies can fail. But Jared Diamond showed with the example of Tikopia Island that there is no environmental determinism of doomsday scenarios. Mindful long-term motivated political decisions of political leaders makes the difference. Diamond highlights that it is important to consider the time-lag of climate change and the momentum of political decisions. If decisions are taken too late, we might not be able to solve problems any more. Though the book is already some years old, the analysis of Diamond is still brilliant and up-to-date more than ever. 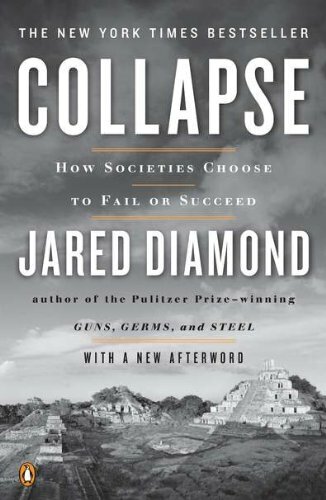 Diamond, Jared (2005) Collapse. How societies choose to fail or to succeed, New York, Penguin Books.